Over the past months Sven has been a regular co-inhabitor of our recording, mixing and mastering rooms. He has been diligently working on his upcoming album-release. Crafting and sculpting the sounds and tracks towards perfection. A lover of full arrangements. “Behind every face there’s a world of its own, with memories and thoughts and places unknown….” : That’s all we can say for now folks… Keep your eyes and ears open. We were happy to be able to greet a longtime friend again last week, while recording the new Snowapple record. It really doesn’t matter what you put in front of Alan “Gunga” Purvis’s or even close to his hands for that matter, it will all end up building you an incredibly rich rhythm & percussion sound. He adds dimensions, feel and layers with incredible ease, and besides that : he’s a very friendly professional to have in a collaboration. We enjoy seeing him in our studio as he teams up with people that know what they want from a recording session. See you next time Gunga ! Producer/Engineer & avid location recorder Chris Hamilton of EEK!Recordings visited our studio last month for a writing session, some production work on Snowapple‘s new tracks and some engineering on the side. If you’re ever in need of an extremely capable engineer and producer for location recordings throughout Europe : Chris has a van full of great gear he can take almost anywhere you like. Give him a call ! We hope to be seeing more of him in the future, as the collaborations with him have always been great, on a professional and on a personal level. Cheers Chris. During our April Spring Cleaning we spent some time moving our old bar-piano. He’s been a long time companion in the studio, since his introduction many years back. Several cool tracks have featured his specific clunky bar-piano sound. Through the years it got harder and harder to keep it in tune, and in recent years it truly was just an approximation. Nevertheless : we kept it around for melancholy’s sake. Now we’ve moved him toward our entrance where you can still admire it. It will serve a welcoming an ceremonial function, as it greets you when you enter from the Amsterdam streets. 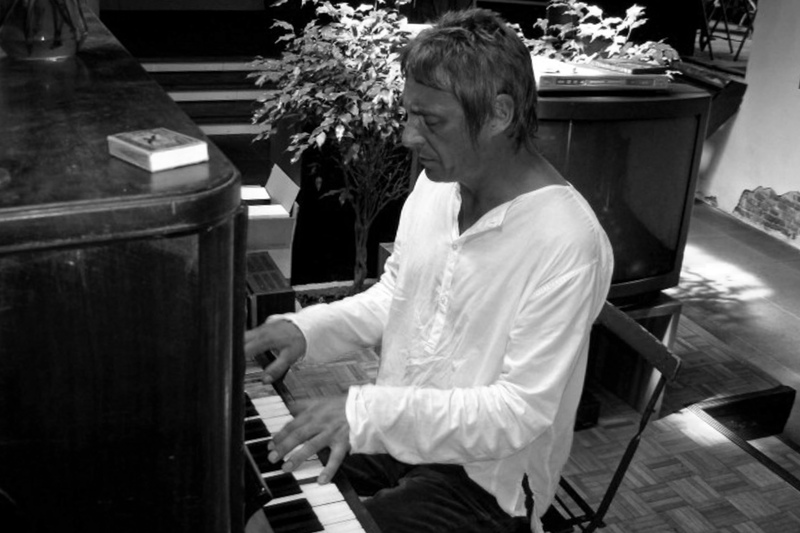 In the picture below you can see Paul Weller tickling it’s ivory’s. When the Big Hunger arrives ; you know you’re in for a treat. We’ve recorded a great album with them, with Joeri Saal and Joost Kroon as producers, and now their back for an additional track that will be released as a single. UK’s Death Rattle was in for a quick visit. They’re working on new material and took some time in Amsterdam to soak up inspiration from the surroundings, the local cuisine (chocolate, mainly) as well as a stack of tracks and sounds they’ve chosen to inspire them for more of their great songs. Check out their official video for The Dig below…. This week we’ve had a nice collective of producers and musicians in the studio. They are all joining Snowapple in the recording of their new album. Two producers have been working on separate tracks. Chris Hamilton of Eek Sound and Daniel Schaub have been working on tracks in respectively Manchester and Berlin. The Lady’s of Snowapple gathered them and themselves in Studio 150 to add vocals, overdubs, effects while simultaneously working towards the first impressions of the mix. For the vocals different set-ups were used including a session in the sun-filled Studio 150 Living Room. Another great week filled with intricate productions and multi-layered harmony vocal’s. The Benjamin Herman Trio has been back in the studio. Jamming & scorching their way thru new tracks for their upcoming album. Stay tuned to their website for information on this release. The sound we’ve been able to create with them for this one is blowing us away.